The University of Cambridge currently has free trial access to Deutsches Literatur-Lexikon Online (Dictionary of German Literature Online). This is hosted on De Gruyter Online. The database currently contains around 70,000 articles and will be updated regularly. A database user guide can be accessed from here and a title list from here. This trial access will remain until the end of December 2017, so please do take the opportunity to explore the content and the database functionality and pass on any feedback to the ebooks@cambridge team at ebooks@lib.cam.ac.uk. Image credit; Artist Kate Greenaway for Robert Browning’s “The Pied Piper of Hamelin.” Public Domain. Early in 2014 the University Library held a successful trial of Knovel, an online service for discovering reference information, interactive content and properties data for engineers and scientists. Thank you to all who participated and provided feedback on how useful this resource is for teaching, research and coursework. As of today until the end of May 2015, University of Cambridge registered users have access to Knovel once again. This has been made possible through the financial support of the Engineering Department, the Engineering Department Library, and the ebooks@cambridge service. You will be able to search for the ebooks, papers and reports included in the Knovel collection in LibrarySearch, the records should appear in the week beginning the 8th December. For a list of subject areas included in Knovel please scroll down. Please contact Niamh Tumelty, the Engineering Librarian on nt311@cam.ac.uk with your feedback on this collection. Your qualitative feedback, together with the extended usage statistics, will be reviewed to help come to a decision with regards to subscribing to Knovel on an ongoing basis. Not heard of Knovel? Missed the chance to try it last time? The Engineering Library, in collaboration with Elsevier, invite academic staff and students from all faculties to an introductory session on Knovel next Monday 8th December at 12 noon in Lecture Room 5, first floor of the Department of Engineering Baker Building, Trumpington Street. The session will be hosted by Jason De Boer from Elsevier, who will give an overview of the trial, provide a live demonstration of Knovel to show how it can support your teaching, coursework and research, and answer any questions you may have. The ebooks@cambridge Service and the University Library have arranged a trial which opens up access to all Cambridge University Press monograph titles on their University Publishing Online ebooks platform. 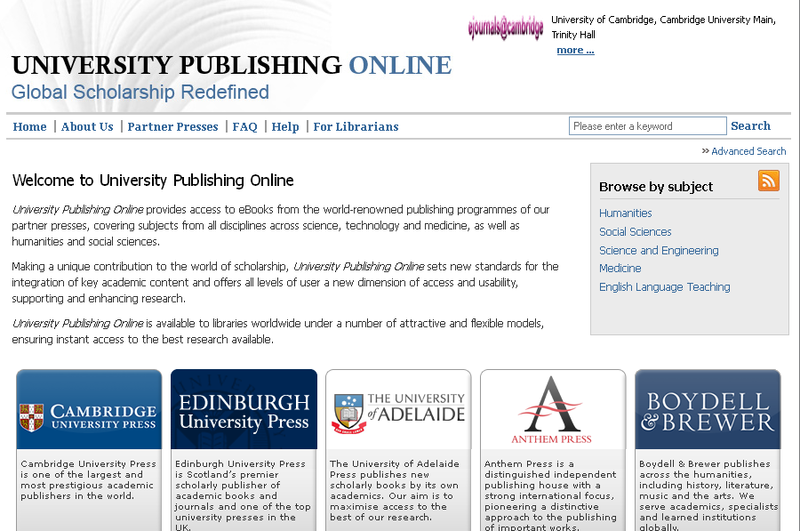 Along with all their Cambridge Books Online (CBO) monograph content UPO hosts hundreds of titles from their partner presses too. These are: Acumen Publishing, Anthem Press, Boydell & Brewer, Edinburgh University Press, Foundation Books, Liverpool University Press, Mathematical Association of America, Royal Economic Society and The University of Adelaide Press. The UPO platform looks and feels very similar to CBO, and works in much the same way. You can browse for titles by subject or search for known items or by keyword in the search box near the top right-hand corner of the home page. There is also an advanced search option which allows you to search only for accessible content or to refine by publisher if you want to. You can open or download chapters as PDFs as you can with all the ebooks owned on the CBO platform. In total 13,955 new monograph titles have been activated for Cambridge University users on UPO and the catalogue records for all these new titles are being loaded over the next few days. These will be searchable in LibrarySearch and available both on and off-campus (using a Raven login). This enhanced access arrangement is live now, starting as a month’s trial with the intention that access to all new content will remain until the end of April 2014 in the first instance. Please note: access to exactly the same CBO content is available from the Cambridge Books Online platform, but this does not include the extra titles from the partner presses. Please let the ebooks team know what you think about the UPO platform and the extra content now available, we would really welcome your feedback. The Centre of South Asian Studies have arranged a free trial for Cambridge University staff and students to Academic Rights Press Asian ebooks on their iGLibrary platform. Access to these ebooks is controlled by IP address so only from university networked pcs on campus. The trial will end on the 30th June 2013. 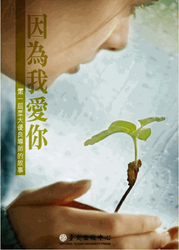 The university already provides access to a collection of SIAM mathematical ebooks on this platform. Please send feedback on the platform and any recommendations for purchase to Rachel Rowe (rmr29@cam.ac.uk) with the Subject line: Ebook recommendations.